1916 Ladies Home Journal Sturtevant Vacuum Cleaners Magazine Advertisement. Big Bargain For a Limited Time For Your New House. B. F. Sturtevant Company, Boston, Massachusetts. Ad is 16" high and 10" wide. Advertisement is in very good condition, suitable for framing. 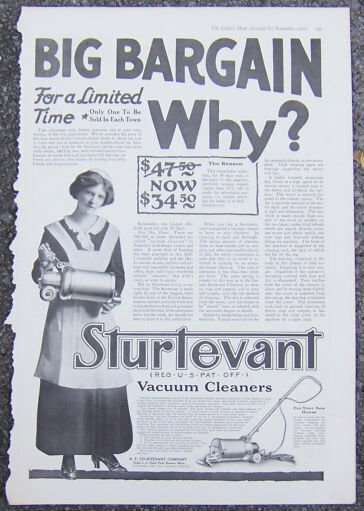 Items Similar To "Sturtevant Vacuum Cleaners 1916 Magazine Advertisement"